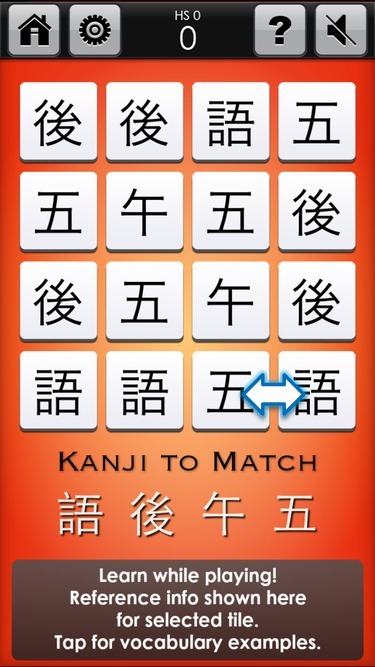 Kanji Crush is like your classic Match 3 game, but designed to make you think about kanji! To play: Make 3 in a row of the target kanji/radicals/onyomi that are displayed below the game board. When a target is matched, it is ‘crossed off’ the target list until all targets are gotten and a special sushi tile appears. The target list is reset and the player continues, with the aim of getting at least 3 sushi tiles on the board to then match to win the game. Careful, it does get harder to match the kanji tiles when the sushi are in the way! If you win the game by matching 3 sushi tiles, you win that sushi tile and go directly to the Kanji Review screen. You can see your sushi collection from there. However, if you run out of matches on the board, the game ends and you lose! You can choose to play the game again with the same set of kanji, or go to the Review Page of kanji from the game. Game modes: There are 4 modes that can be set in 'Options', which classify kanji either based on radical or on the 'onyomi'. For each of these there is one mode in which you match identical kanji and one for matching same-featured kanji . *N.B. On the web version all sets are unlocked - the mobile version unlocks them all with one in-app purchase. To mark any kanji as ‘known’ so that it will not be used again in the game, tap it and hold for a second and you will see the kanji turn a darker shade. In this view kanji from your selected sets are grouped by their main radical (n.b. not by ALL components). This can help you to make connections with radical-meaning, radical-reading, and to distinguish between look-alike kanji, a big problem as you start to accumulate more kanji! 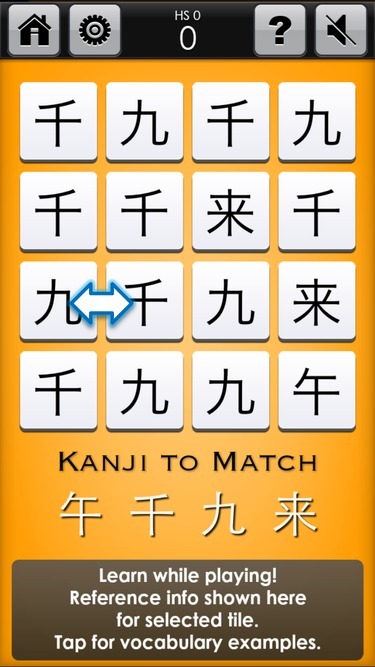 This is a classic Match 3 game, but designed to make you think about kanji! Tap kanji that are next to each other vertically or horizontally (not diagonally) to swap their position, to make 3 in a row of the target kanji displayed below the game. N.B. The tiles will only swap position if they make a match! When a target is matched, it is highlighted on the 'Kanji to Match' list below the tiles until all have been achieved and a special sushi tile appears. The target list is reset and the player continues, with the aim of getting at least 3 sushi tiles on the board to match and win the game. The 4 targets to match are displayed below the tile board. 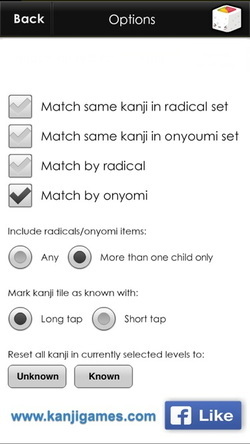 They can be single kanji, or radicals or onyomi, depending on the game mode set in ‘Options’. i) Same Radical: Match 3 identical kanji. The actual kanji to match are displayed below the board, and they all share the same main radical. This mode can help the player to distinguish similar-looking kanji, and form connections between kanji based on their radical, onyomi and reading in order to help remember them. ii) Same Onyomi: Match 3 identical kanji. The actual kanji to match are displayed below the board, and they all share the same onyomi. This mode can help the player to group together kanji with the same onyomi, to form connections between the kanji, and their onyomi and radicals. iii) Match by Radical: Match different kanji that contain the same main radical. The radical on which to base the match on are displayed below the board. This mode can help to build an awareness of the components of the kanji. N.B. 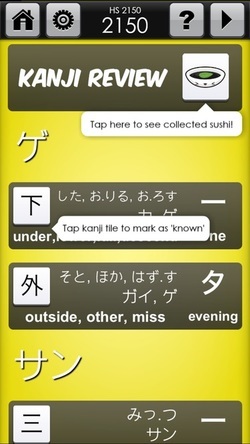 You can check the radical for any kanji tile by selecting it and tapping the left-hand info box. The radical info appears in the right-hand box. iv) Match by Onyomi: This is the hardest mode, requiring the player to match different kanji based on one of their onyomi. This can help the user mentally group together same-onyomi kanji to remember them better. N.B. The player should also refer to the right-hand info box below the game to see the onyomi used in compounds. If there are no further matches on the board, the game ends and you can choose to play the game again with the same set of kanji, or to review the kanji from the game. If you win the game by matching 3 sushi tiles, you go directly to the Kanji Review screen. After the game, you will go to a ‘Kanji Review’ screen where you can see all the kanji that appeared in the previous game. Check any kanji you are not familiar with, and take the time to check some compound words in the right-hand information box for each kanji listed. You can tap on a kanji tile to mark it as ‘known’, from which time it will be displayed on your main screen in a darker shade and not be used in any further games. Tap on the saucer next to the 'Kanji Review' title to go to you 'Sushi Collection' page showing all the sushi you won from games! Same Radical: Match 3 identical kanji. Same Onyomi: Match 3 identical kanji. 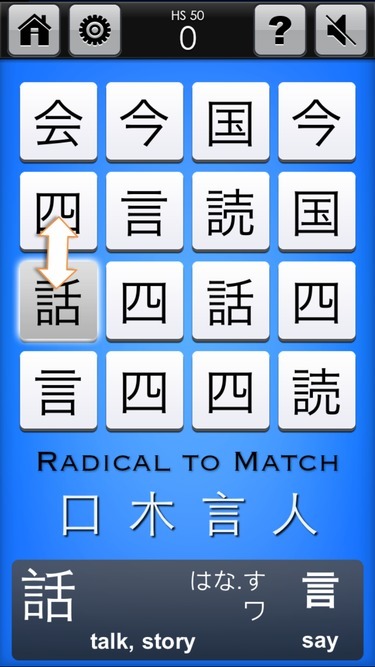 Match by Radical: Match different kanji that contain the same main radical. 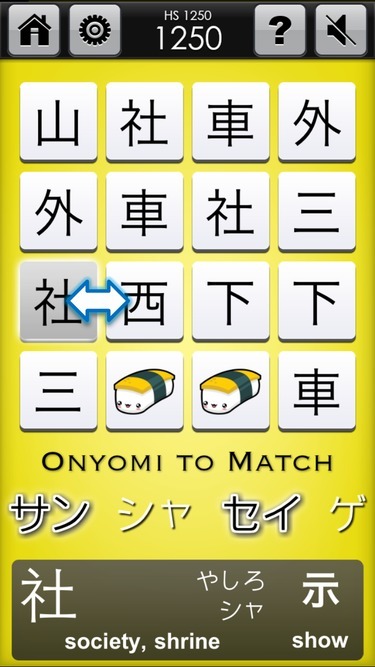 Match by Onyomi: Match different kanji that share the same 'onyomi' reading. If you want to focus on only kanji you don’t know, you may want to toggle many kanji on your main screen to ‘known’ – if so, temporarily set this to ‘short tap’ to make selection more convenient. 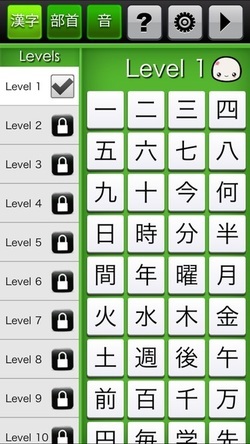 You can reset or mark as known all the kanji in all currently selected levels here. If there are just a few kanji in a particular set that you want to practice, you could select that that set, mark it all as ‘known’ here in options, then toggle individual kanji that you want to practice back to not ‘known’ .